For a full accounting of the NCAA Championships, be sure to read Jesse’s post postmortems. Bolt’s 9.88 after a poor start is a huge positive for him and a bit discouraging for anyone who thought of challenging him at the Olympics. It wasn’t a Diamond League field, but Saturday’s race at the Racers Grand Prix in Jamaica did feature Nickel Ashmeade and Yohan Blake. Those two finished second and third, both time in 9.94. He’s ahead of where he was last year by a mile and is running against quality competition–two things that didn’t happen last year until two weeks before the World Championships. If you want to argue that the men’s 100m is already decided, I’m not going to quibble with you. Extrapolating what Bolt will run in mid-August after a putting up a 9.88 in June leads to only one possible conclusion. Apart from that, the only vulnerability is the start. Thus far, that’s been viewed more as a reason why he can run even faster, rather than as a possible liability come championship time. In one of the few standout marks from Oslo, Schippers ran 21.93 in the 200m. She took the world lead from Tori Bowie and soundly beat her closest competition, Jamaica’s Elaine Thompson. The women’s 100m and 200m is morphing into one giant super event. Schippers, Bowie, Thompson have run both events frequently and with great success. With Shelly-Ann Fraser-Pryce’s injury issues I’m guessing she avoids the 200m, but maybe English Gardner jumps in at the Trials and tries to become another 100m/200m Olympic doubler. In a flashback to the glory days of 2014 and 2015, Barshim jumped 2.40m. He also took two attempts at the world record of 2.45m. As recently as a week ago, he was struggling to clear 2.30m so this is a welcome sign for Barshim and all his other jumping compatriots who feed off the momentum of the high clearances. We are going on week three of Nike v. Berian. Berian’s coach said in an article posted this weekend that Berian is willing to skip the Olympic Trials rather than compete in Nike gear. That would mark the second straight year that America’s top 800m runner isn’t on the championship team because of a sponsorship/rules issues. As if the rest of the world needed any more help. More 800m news. And as of this writing, Donovan Brazier (more on him below) the star of the NCAA Championships hasn’t decided whether or not he is running the Olympic Trials. 1:43.55 and breaking Jim Ryun’s collegiate record makes him beyond qualified. His time puts him seventh on the American all-time list. The way he ran on Friday is a natural fit for the Trials setting. Brazier sat on Brandon McBride’s shoulder until the last curve before sprinting away. Replace McBride’s name with another natural frontrunner (Boris Berian) and the race two weeks from now in Eugene sets up perfectly for Brazier to mimic his run at the NCAAs. I’m guessing any hesitation about his decision to race at the Olympic Trials will begin to fade when it begins to sink in that he ran ONE FORTY THREE. He doesn’t need to improve at all between now and Eugene and he will comfortably qualify. Besides, the option isn’t between Trials and rest. It’s between the Olympic Trials/Olympics and the World Junior Championships. The World Junior Championships 800m final is on July 24th. The Olympic final is August 15th. If he opts for the Olympics, his season is about 22 days longer (assuming he makes the final of both). 22 days doesn’t seem like a major sacrifice for the chance to compete in a meet that only happens once every four years. A consequential result in an inconsequential distance. Wayde Van Niekerk beat Lashawn Merritt, 31.03 to 31.23 in the 300m in Jamaica. It was the first meeting between the two this year. Van Niekerk has run sub 10 and sub 20 in addition to his exploits at the 400m. Those shorter distance personal bests would hint that he would have the edge at the 300m, but Merritt has run 19.77 in the 200m this year. The race itself looked a bit like what we’ve seen from Merritt in his races against Kirani James. Van Niekerk hopped out to an early lead and put Merritt in the position of chaser. Merritt got some of it back on the homestretch, but couldn’t quite bridge the cap completely. Oliver ran 13.09 in the 110 hurdles. This is the first sign of the year that Omar McLeod may get a challenged. He didn’t race in Jamaica, but has ruled the event thus far in 2016. From an American perspective, Oliver’s time puts him atop the U.S. group heading into the Olympic Trials. Not a familiar name to most, but he will be getting more attention after he ran 19.88 in Jamaica, the third fastest time of the year in the 200m. 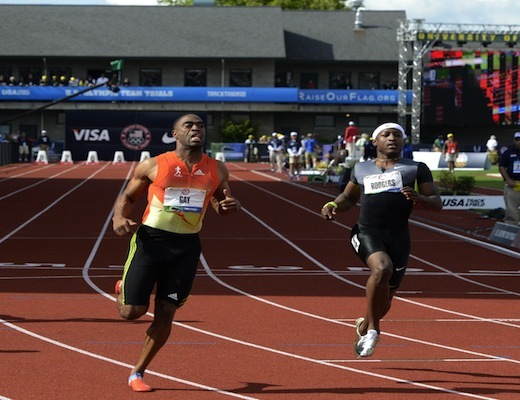 That means that in late June of an Olympic year the top three in the event are Lashawn Merritt, Ameer Webb and Francis. Asbel Kiprop (3:51.48) and Faith Kipyegon (4:18.60) won their races comfortable in Oslo. Kiprop continues to look effortless and and untouchable, while Kipyegon is waiting around for Genzebe Dibaba to show up and give her a race. In Jamaica on Saturday, she rebounded from her last place finish at the Prefontaine Classic to win in 11.09. She still has a long way to go. Running 11 seconds will by no means get on the medal stand in Rio. But it’s at least an assurance that the toe injury won’t derail her season. Watch her next couple races. If her last few season are any indication, she will begin to wrestle control of the event in the run-up to the Olympics and start to peak as the early season stand outs begin to fizzle. Nesta Carter’s B sample came back positive, which means Jamaica might have to return their medals. Jamaica’s run was also a world record. Trinidad and Tobago, who it seems have been elevated into more relay medals due to DQs than any other country, would move into the gold. See how just a sprinkle of methylhexaneamine changes the course of track and field history? She scratched out of the Oslo women’s 3000m steeplechase depriving us a rematch in what I believe was the best race of the year so far. 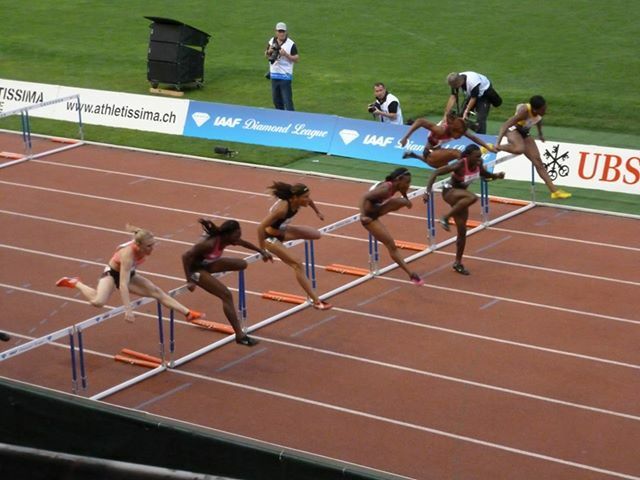 The women’s steeplechase at the Prefontaine Classic had all the parts of a great race. Fast time, exciting last lap, and a dramatic finish. Hyvin Kiyeng Jepkemoi, who finished a close second to Jebet in Eugene, won in Oslo. Without Jebet in the field, Jepkemoi dominated and took the win by 50 meters in 9:09.57. He pulled up the 100m in Oslo before coming across the line in 11.59. He said after the race it was cramp so expect another sub 10 from him this year. And the next year. And the year after that. And then, hey it’s only one more year until another Olympics so might as well do one more. Other than Brazier, some of collegians who starred over the weekend at the NCAA Championships in Eugene…..
Before this weekend, Murphy was mostly known for his 800m skills. He got the call to replace Nick Symmonds at the 2015 World Championships and acquitted himself nicely in Beijing. I don’t think you’d expect a 800m runner going up in distance to the 1500m to fare as well in a fast race. Perhaps that’s why the leaders in Friday’s final kept such an honest pace through the early laps. Their attempt to shake Murphy looked like it might work. He was fourth with a lap to go and third at the top of the homestretch. Murphy never was out of contention though and his position in the race looked like one of poise than desperation. In the final 100 meters he took off and won in 3:36.38. Like I said, an 800m runner winning in a fast race is all kinds of scary to his future competitors. With closing speed like that, I’d have to assume he’d be just as effective in a race that is won in 3:46. Where does he focus for the Olympic Trials? The 1500m looks more open because it doesn’t have Boris Berian (if he runs) and Donovan Brazier (also, if he runs). Matthew Centrowitz is the incumbent in the 1500m, but who is the next best American in the event? Surely you can’t name two other men who are definitely better than Murphy right now. It’s a tough decision to make. There is the option to run both. The 800m is in the first four days and the heats of the 1500m begin after the break. It seems like a logical plan to do both, unless Murphy thinks the better chance to qualify is the 1500m and that running the 800m might compromise his ability to place top three. Good problem to have. Update: Murphy won the Portland Track Festival 1500m so he’s beaten professional fields at both 800m and 1500m this year. After missing last season with a knee injury, Allen won the NCAA championship in the men’s 110m hurdles. He ran 13.50 in the final and 13.38 in prelims. Unless there is a strong breeze in the faces of the runners at the Olympic Trial, those times will be on the outside of the top three. But it’s the hurdles, where unpredictable is the norm. In 2014, Allen ran 13.16 at the NCAA meet and then matched that time when he won the US Championships. He will have to take a different route this year. None of his marks in isolation (10.22 in the 100m, 20.19 200m, 8.15m in long jump) make him a lock to make the Olympic team, but are you going to count out a guy who did something that hasn’t been done since Jesse Owens? Lawson’s triple (he also helped Arkansas finish third in the 4 x 100m) is rare occurrence even for a high school conference meet, let alone in one of the deepest meets on the calendar. His double didn’t have the shine of Andre De Grasse’s 9.75/19.58 from last year, but he also didn’t have the wind going in the right direction and isn’t Andre De Grasse. Few out there are. His best opportunity will come in the long jump. Lawson’s lifetime best of 8.34m would put him third on the 2016 chart and the second American behind only Marquise Goodwin. While we are on sprinter doubles, how about Oregon’s Ariana Washington? She ran 10.96 (wind-aided) and 22.21.
he only thing you’d worry about in this situation is maintaining this type of running throughout the summer and into the Olympics. She has experience with that though, last year she set a lifetime best at NCAAs and then two months later had enough left to finish second in at the World Championships. More experience and a faster personal best could push her over the top this year. She won the final by .5 seconds in 50.36. More impressive was her prelim when she ran 50.48, while trying to slow down. After the race she was bothered that she went as fast as she did in an early heat. Looking ahead to the Olympic Trials, she has fewer question marks than the rest of the field. Allyson Felix has missed time because of injury. Sanya Richards-Ross is hurt. Quanera Hayes didn’t run well at Prefontaine. Francena McCorory and Natasha Hastings have run consistently, but neither has broken 50 seconds as of yet. She jumped 14.53m to win the women’s triple jump and set an U.S record. Just where does being the best American ever put you on the yearly list? Seventh. Yes, the women’s triple jump hasn’t exactly been a strength of the U.S. throughout the years. Orji will be a big favorite to make the team and at least gives the Americans a jumpers chance in Rio. Frerichs took down Jenny Simpson’s collegiate record on her way to a huge victory in the women’s 3000m steeplechase. Frerichs’s 9:24.41 puts her behind Emma Coburn and Leah O’Connor on the yearly American list. Coburn is the clear favorite and is expected to win comfortably. The other two spots are up for grabs. Ashley Higginson and Stephanie Garcia are were the picks entering the year, but O’Connor and Frerichs are running the best (other than Coburn) right now. The way women’s steeplechase has been improving in the United States, it might actually take something quicker than what Frerichs ran on Saturday to qualify.